There is no moral issue that grieves and saddens me more than abortion. I believe that abortion is, perhaps, the most egregious example of man’s inhumanity to man. But I am not writing this article to preach, judge or condemn. My purpose and motivation are to have a positive influence, to help save the life of at least one unborn child and to encourage at least one regretful mother to find forgiveness and peace. When I took my first formal course in high school Biology in about 1960, everyone seemed to know that human life begins at conception, the union of a man’s sperm with a woman’s egg. Without uniting in the womb, the egg and sperm have no human life at all and do not develop into anything; they remain just an egg and a sperm and soon die. The part of the human “life cycle” that we universally agree includes all of the developmental stages of human life from babies to teens to adults actually begins with conception in the mother’s womb. Those are the basic, biological facts of human reproduction. So, from a biological perspective, human life begins at conception and proceeds on an uninterrupted continuum of developmental stages, first in the womb, and then outside of the womb. There is no identifiable point in this continuum at which an unborn child becomes suddenly human; the unborn child is a human being all along. The idea that there is a moment when a developing child changes suddenly from non-human to human is a fantasy that has no basis whatsoever in the science of biology. Rather, it is purely a figment of the human imagination, designed to rationalize the termination of innocent human life in the womb and, thus, avoid the enormous emotional toll that routinely follows in the aftermath of an abortion. 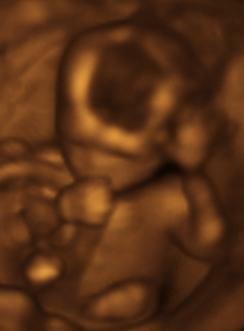 Ultrasound images or videos — especially the new 3-D versions, see above — of a developing child in his/her mother’s womb will provide conclusive and convincing evidence that the unborn child is, indeed, a human being in the early stages of development. How could David have been sinful before he was a person? If he was sinful from the moment of conception, then he must also have been a person from the moment of conception! God has a plan for each of us, before we are even born! What is God’s plan for your unborn child? Abortion is an attack on the very image of God himself. I would guess that very few people are aware that the Bible has stern rebukes and dire warnings for those who approve of sin or encourage others to sin, but it does (Leviticus 19:1; Isaiah 5:20; Malachi 2:17; Matthew 5:19-20; Matthew 18:6; Romans 14:22). Thus, anyone, including born-again Christians, who even approves of or encourages the sin of abortion will, someday, have to answer to God for it. If that’s you, then now is the time to repent! It’s important to keep in mind that there is no sin that is so big and so bad that God will not forgive it. In fact, God wants to forgive you and bring you peace. He has made this promise to you: “If we confess our sins, he is faithful and just and will forgive us our sins and purify us from all unrighteousness.” (1 John 1:9). He is “faithful” to forgive you because He has promised to do so, and God does not lie or break His promises (Numbers 23:19); He is “just” to forgive you because Jesus paid the full price for your sins when He suffered and died for them, in your place, and, therefore, it would be unjust to not forgive you. And He doesn’t stop there. He will also cleanse you from the stain of your sin and of the guilt and shame associated with it; God will separate your sins from you “as far as the East is from the West” (Psalm 103:12), and he will not keep bringing it up and holding it against you (Isaiah 43:25). You have God’s word on it (Numbers 23:19), so take Him at His word, receive His forgiveness and move on with the peace of Christ; God has a wonderful plan for your life. If you want to make me cry, then remind me of the accidental traffic death of my daughter, Liesel, when she was only 20 years old. Or, remind me of the accidental drowning deaths of twin toddlers in Knoxville a few days ago. But, if you really want me to weep and mourn deeply, then remind me of the intentional deaths of tens of millions of innocent, helpless, unborn babies, murdered in their mother’s womb, in America since Roe v. Wade. The United States will have no claim wha…tsoever to any moral high ground concerning anything, unless and until we, as a nation, rise up against this, the most despicable of man’s inhumanity to man, and legally declare it to be what it is: murder of the worst kind. And that’s why we need more and more pro-life justices, judges, governors, legislators, presidents and God-fearing voters to lead the charge against abortion. America, bless God and stand against this national tragedy! This entry was posted in Biblical Teachings and tagged Abortion, Bible, Biology, conception, eternal life, faith, forgiveness, human development, human reproduction, image of God, inhumanity, life cycle, peace with God, Prenatal development, repentance, salvation, Sin, ultrasound, womb. Thank you, Peter for your comment and question. Here’s my perspective. Your suggestion is exactly how I view this issue, and you can find this view developed by Gleason Archer in “The Encyclopedia of Bible Difficulties.” Many people prefer to believe that all babies go to heaven because they have not yet reached the age of accountability, and it gives them comfort and assurance to believe that. I do not force this issue, because I not believe that such an assumption/teaching is dangerous for the most part, but it did inspire at least one misled mother to drown all of her young children to ensure that they would go to heaven! God knows fully how to judge each and every one of us with truth and justice, regardless of our number of days upon planet earth. Thank you, Sheryl, for sharing that powerful testimony. I hope many will read it and be guided by it. God is good. Thank your for following the leading of the Holy Spirit. I’ve seen the results of abortion first hand. I was working as an RN in a hospital in the middle of the night when admissions sent me a woman in labor. She had had a saline abortion, but had not as yet delivered the baby. I delivered her dead baby boy in a bedpan. At the time I was not a Christian but an ultra liberal. I did not object to abortion before that incident. I felt, as many do, that I wouldn’t have an abortion, but others could if they wished. Even Bernard Nathanson, the first president of NARAL (who had performed tens of thousands of abortions), stopped aborting babies and became a spokesman for the sanctity of life after viewing babies in the womb via sonograms. You’re welcome, Sheryl. It would have been wrong of me not to speak out. The Lord showed me how to do it. May He bless you all ways. Thank you for speaking out. Blessings to you.